Children, Hot Weather & Cars = Danger! Safety experts, including the LAFD and NHTSA say "Look Before You Lock" your car to save the life of a child. With 43 child deaths in the United States last year attributed to children left alone in hot vehicles, the Los Angeles Fire Department is asking for your help: We need to make sure no child dies as the result of being left alone in a hot vehicle! • Always put something you'll need - such as your phone, handbag, a sunshade, lunch or briefcase on the floor in the back seat. This will make you open the back door of your vehicle every time you reach a destination. This way, making sure no child is left behind becomes a habit. Safety experts at the National Highway Traffic Safety Administration and LAFD call this the 'Look Before You Lock' campaign. • Keep a large teddy bear in the child's car seat when it’s not occupied. When the child is placed in the seat, put the teddy bear in the front passenger seat. It's a great visual reminder that anytime the teddy bear is up front, a child is secured in a child safety seat behind you. You can also place the child's blanket or toy on your lap while driving, to serve as a reminder when you exit the vehicle. Giving your child passenger a noisy toy is yet another way to remind you that someone is counting on you to keep them safe at all times. • Make arrangements with your child’s day care center or babysitter that you will always call them when your child will not be there on a particular day as scheduled. This is not only common courtesy, but makes sure everyone involved in the care of your child is informed of their whereabouts. Ask these caregivers to always phone you if your child doesn’t show up when expected. 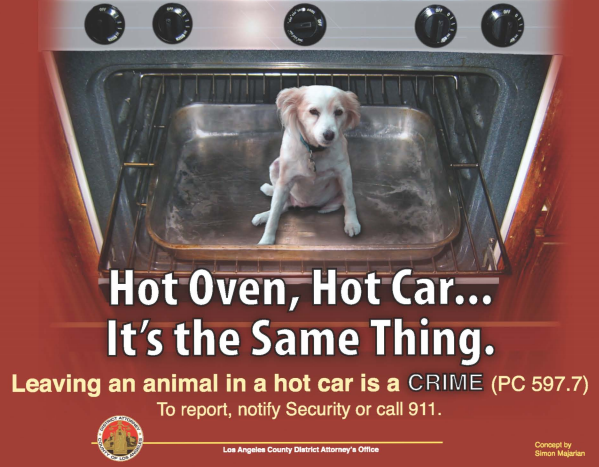 • If you see a child (dependent adult or pet) alone in a hot vehicle, get involved. If they are hot or seem sick, get them out as quickly and safely as possible. Call 9-1-1 or your local emergency number for assistance as necessary. • Never leave your car keys where children can access them, and always make sure your car is locked so that children cannot get in without adult supervision. • Do not underestimate a child's capabilities. Teach your children about the dangers of a car, especially the car trunk. Most children can differentiate between a tool and a toy. Make certain they know that a car is not a toy!